Manuel Noriega, the former military dictator of Panama, is suing Activision for using his name and likeness in Call of Duty: Black Ops 2. 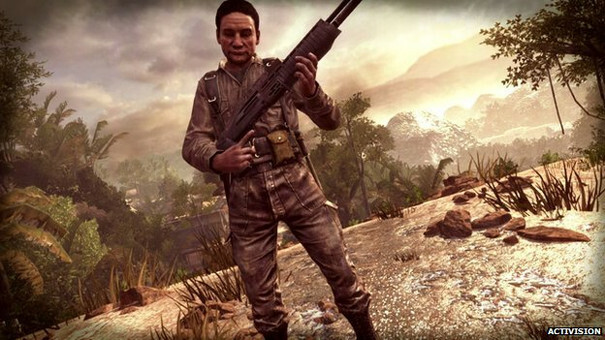 Noriega features in the Suffer With Me level of Black Ops 2. In it, Alex Mason and Frank Woods track and capture Noriega in outer Panama City. Noriega, 80, was the military dictator of Panama from December 1983 to December 1989, when he was captured by invading US forces and removed to America as a prisoner of war. In the US, he was tried on eight counts drug trafficking, racketeering, and money laundering. Following his sentence in the US, he was extradited to France where he served a further seven years on money laundering charges. He is now serving another 20 years in a Panama jail. The lawsuit, filed in the Los Angeles County Superior Court, contends that, "In an effort to increase the popularity and revenue generated by Black Ops 2, defendants used, without authorization or consent, the image and likeness of plaintiff in Black Ops 2. "Defendants’ use of plaintiff’s image and likeness caused damage to plaintiff. Plaintiff was portrayed as an antagonist and portrayed as the culprit of numerous fictional heinous crimes, creating the false impression that defendants are authorized to use plaintiff’s image and likeness. This caused plaintiffs to receive profits they would not have otherwise received." Noriega claims the game portrays him as "a kidnapper, murderer and enemy of the state", and is suing for "unjust enrichment, unfair business practices, violation of common-law publicity rights, and lost profits." Speaking with the BBC, US entertainment and tech lawyer Jas Purewal said Activision does not need to respond to Noriega's suit as he is not a US resident or citizen. "In the US, individuals have what's called the right to publicity, which gives them control over how their person is depicted in commerce including videogames," said Purewal. "It all focuses upon the American legal ability for an individual to be only depicted with their permission, which in practice means payment of a fee. It's all about the multiplayer.